Last weekend, while in town for the Moot Court competition at De Paul, we happened on the exhibition at the Museum of Contemporary Art in Chicago. Entering the exhibit I was unsure what to think. 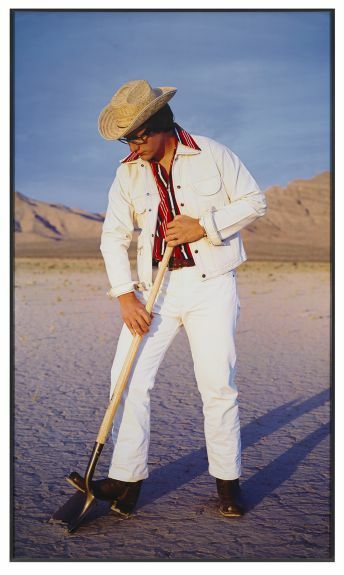 We were confronted with this work by Tony Tasset from 1995, recreating what the artist imagined Robert Smithson was wearing when creating his earthworks. Contemporary art can be challenging, but how much art can one draw from a shovel I thought? A great deal it turns out, as the ‘art of the shovel’ grapples with art history and the looting of archaeology in ways that few have. By the end of our visit, I was shocked that the archaeologists and folks in the heritage community had not been championing this exhibition. How had I not heard about this before, particularly given all the folks in Chicago who work on heritage issues. The exhibit goes deep, engaging with history, archaeology, archival research, and iconoclasm. It channels what curator Dieter Roelstraete calls the “historiographical impulse in contemporary art”. Which means, I think, how contemporary art embraces the past. The exhibition includes 34 different artists; it includes paintings, sculptures, photography, videos, installations, and video performances. 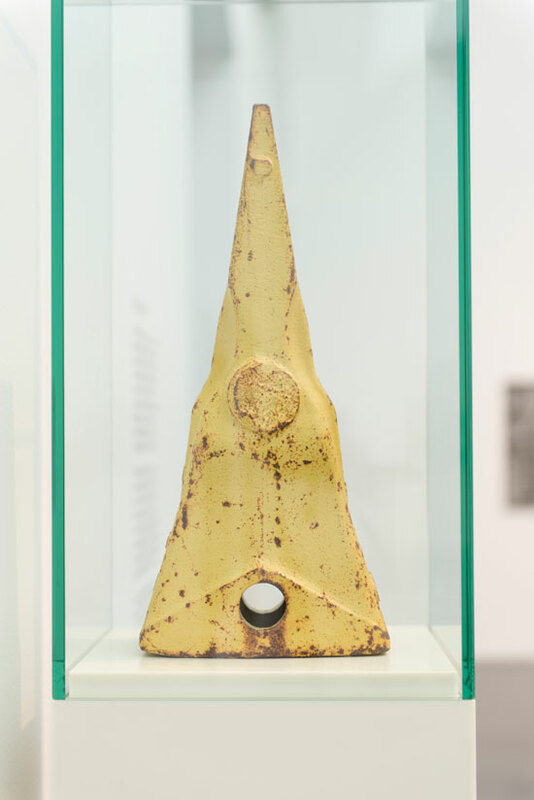 The exhibitions all deal in some way with “excavating” either directly in the case of archaeological excavation, or digging into historical archives, or little-seen museum collections. 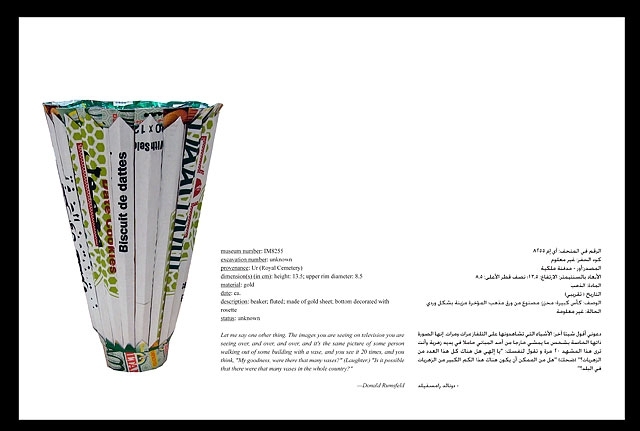 The standout of the exhibition for me was a series of works by Michael Rakowitz, a contemporary artist of Iraqi descent. His exhibition is titled The Invisible Enemy Should Not Exist. 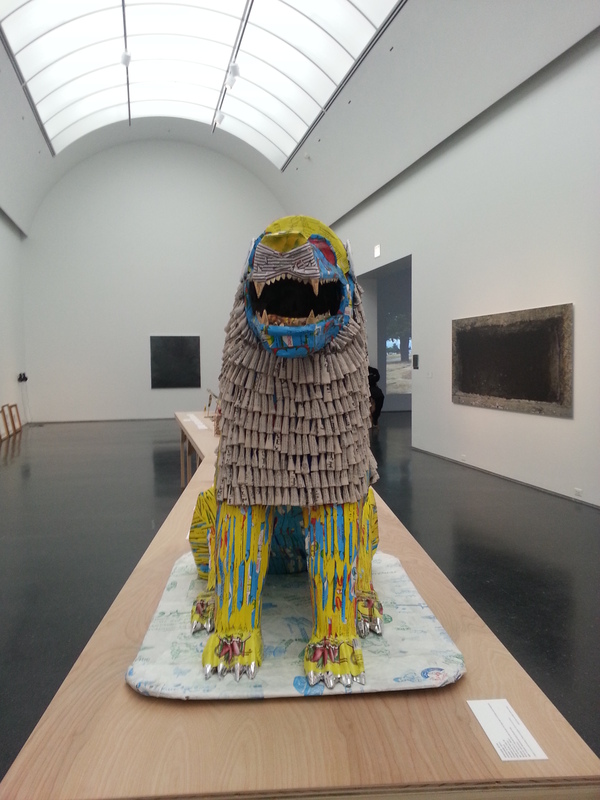 It comprises a long table of newspaper sculptures and museum labels. 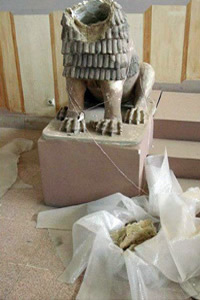 The table here shows the toll of the theft from the National Museum of Iraq after the U.S.-led invasion. The largest piece was this lion. Its display card points out the original was badly damaged by looters during the Iraq invasion in 2003. It has since been put back together, but the cheap newspaper used to create the lion was done with great care—the handmade nature of these pieces makes them almost whimsical, something you’d buy at a tourist shop. These handmade creations differ from the failure to safeguard what taken or looted when military forces invaded Iraq and Baghdad. More troubling is the notion that many of these antiquities were hurriedly wrapped in newspaper packaging for quick transportation. The title of this sub-exhibition “the invisible enemy should not exist” is the direct translation of the name for the processional street that ran through the Ishtar Gate. The Ishtar gate was excavated between 1902-1914 by German archaeologists, and removed to the Pergamon Museum in Berlin. The contours of the table holding the works is, according to the artist, also in proportion to that processional way. The artist, Michael Rakowitz intends this to be an ongoing exhibition, which will assist in “recuperating” the nearly 7,000 objects that remain missing from the Baghdad museum. Each piece has a small ‘museum card’ next to it, which details the original object, and gives an update as to its present location. Many are of course still missing. But not only that, each card also carries a small quotation from experts or important actors in the looting. Such as Iraqi archaeologists, and even the inimitable Donald Rumsfeld is included, whose press conferences during the looting defied belief. Opposite the table are pencil drawings telling the story of the Ishtar Gate, Iraqi archaeology, and Donny George, the former director of the National Museum of Iraq. George we learn joined archaeological digs to avoid BA’ath Party meetings; and he also spent time in a Deep Purple cover band. A Middle-eastern style cover of Deep Purple plays on a continuous loop in the exhibition. The effect is comic-book like, and also cinematic. Also included in the same gallery is a series of images by Jean-Luc Mouléne which were part of a 2005 work called Le Monde, Le Louvre. The artist took photographs of seldom-seen cult figurines in the Louvre’s collection, and included them in a special section of Le Monde. The close up images revealed a lot of detail that we don’t often see when these small figurines are exhibited, if they are even exhibited at all. Though we did not have time to take advantage, there is an audio guide with commentary from the artists, curator, psychoanalysts, historians, and of course archaeologists. This is the kind of exhibit the heritage community should be championing in my view. It raises awareness, makes us think about our recent and ancient past, and most importantly forces the viewer to think critically about history and archaeology. The exhibition is organized by Dieter Roelstraete, Manilow Senior Curator at the MCA Chicago. It ends soon, on March 9, 2014.